With fall here and the weather outside becoming chilly we are celebrating Sunday Supper with warming trend recipes to keep you cozy when the temperature drops. One of my favorite ways to stay toasty this time of year is Pumpkin Cinnamon Rolls With Maple Cream Cheese Frosting warm out of the oven first thing in the morning. 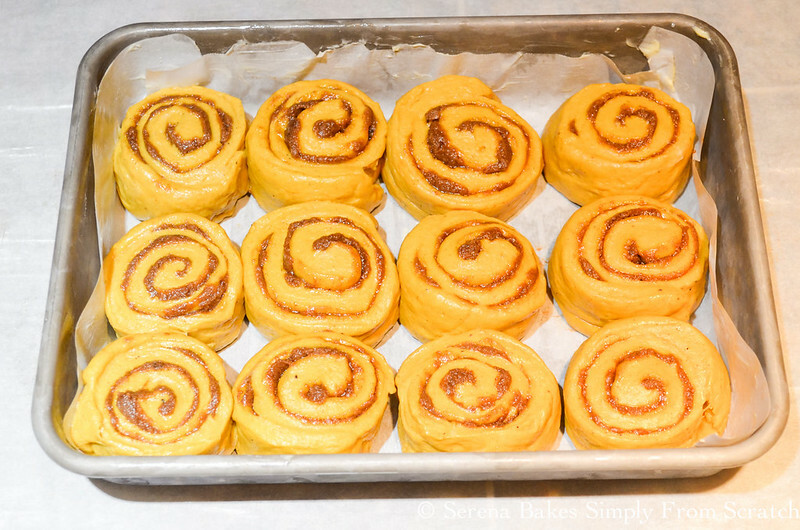 Pumpkin Cinnamon Rolls are assembled the night before then refrigerated and allowed to rise while the oven preheats in the morning making them the perfect way to start even a busy day. It makes climbing out of bed on the weekends all the more enticing! The pumpkin is perfectly balanced with notes of vanilla, cinnamon, ginger and nutmeg with a sticky gooey cinnamon, brown sugar, honey filling and covered with a sweet maple cream cheese frosting. These rolls are so good my friends that even if you usually just eat the center you will find yourself savoring every last layer of deliciousness. Heat 3/4 cup Buttermilk until warm but not hotter then 110 degrees. 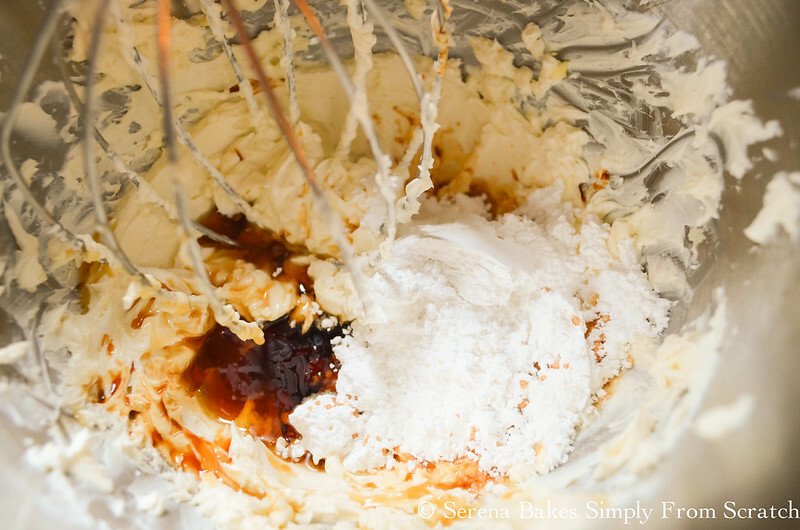 Add warm buttermilk, 1/2 teaspoon Honey and 2 (1/4 ounce) packages of Active Dry Yeast to a mixer fitted with a dough hook. Allow mixture to sit until bubbly about 8 minutes. Stir in 3/4 cup Brown Sugar, 1 1/4 cup Pumpkin Puree, 2 teaspoons Vanilla Extract, 2 teaspoons Ground Cinnamon, 1 teaspoon Ground Ginger, 3/4 teaspoon Nutmeg, 3/4 teaspoon Allspice, 2 whole Eggs and 2 whole Egg Yolks until well combined. Add 5 1/4 cups All-Purpose Flour or Whole Wheat Pastry Flour and 1 teaspoon Salt. Knead on low and then increase speed to around 4 until soft dough forms that pulls away from bowl and is soft, smooth and elastic around 5 minutes. 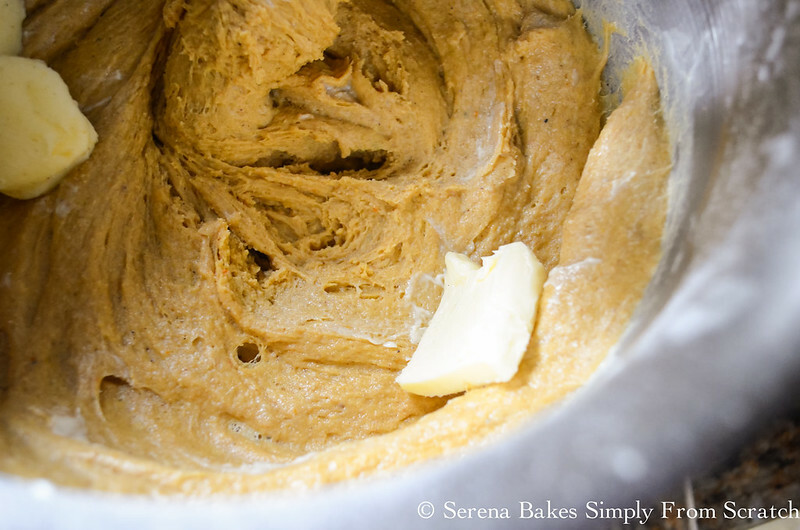 Add 14 tablespoons Room Temperature Butter 1 tablespoon at a time while kneading on 4. Dough will become gooey and soft but continue to knead. Until dough become soft, smooth and pulls away from edge of bowl. 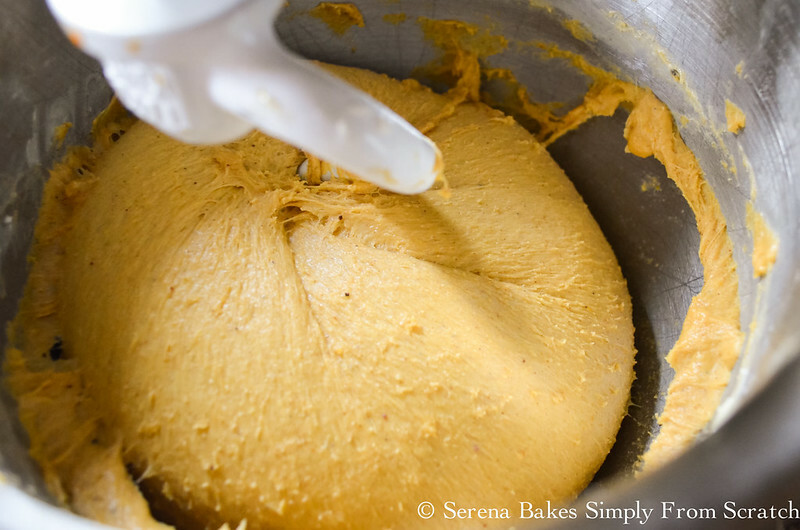 Place dough in a well buttered bowl. Place top of dough into bowl first and then flip over to cover top of dough in butter. Cover bowl and allow dough to rise until doubled in size around 2 hours. 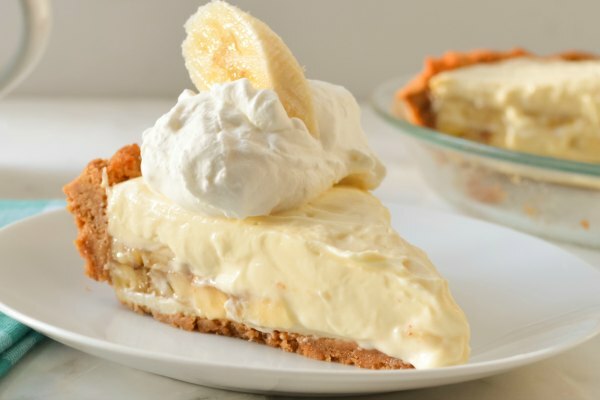 Mix together 6 tablespoons Room Temperature Butter, 1 cup Brown Sugar, 1/2 cup Sugar, 1 teaspoon Vanilla Extract, 3 heaping tablespoons Honey, 2 tablespoons Cinnamon and 1/2 teaspoon Salt until well combined. 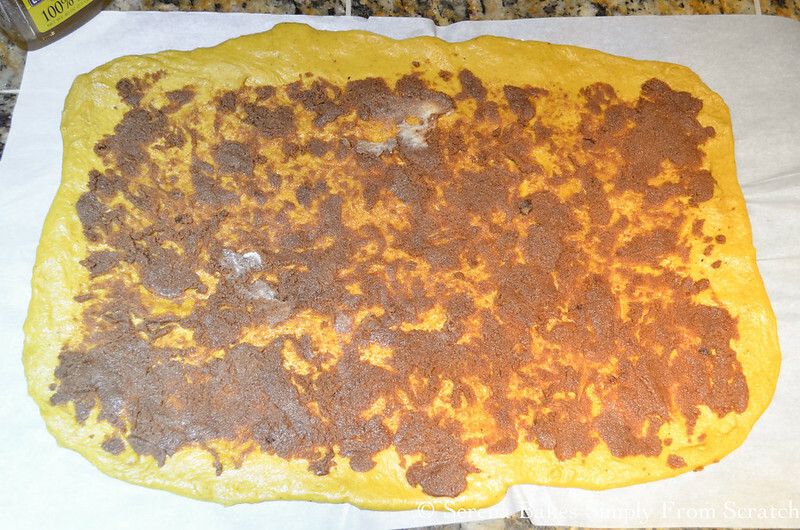 Divide dough in two and roll each half into 12"x18" rectangle. 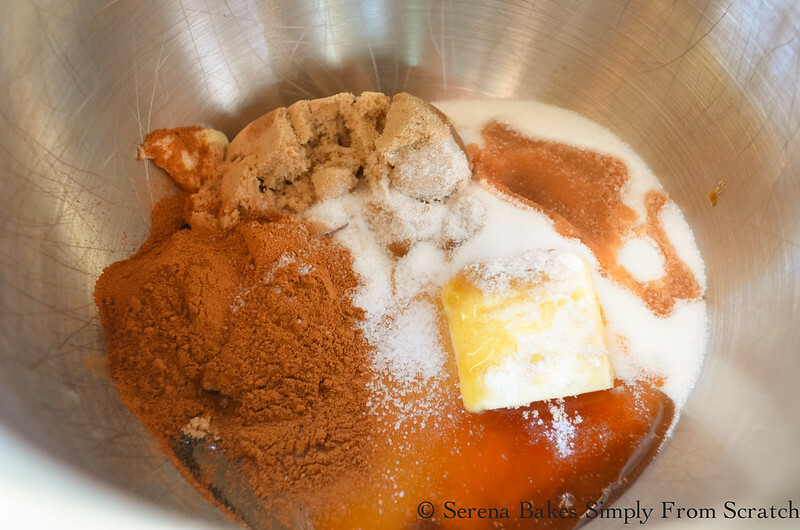 Spread half of the brown sugar, cinnamon, honey mixture over each half of dough. Roll dough to form an 18" long roll. Pinch seams tightly together and slice 2" thick. Butter a 9"x13" and 8"x8" pan. Place rolls evenly spaced into pans, cover and refrigerate overnight. When ready to bake remove pan from fridge and allow to come to room temperature about 30 minutes. Preheat oven to 375 degrees and bake for 30-35 minutes until a toothpick inserted into the center of rolls comes out clean. Beat together 8 ounces Room Temperature Cream Cheese and 1/4 cup Room Temperature Butter until creamy and well combined. Then beat in 1 cup Sifted Powdered Sugar, 3 tablespoons Maple Syrup and 1 teaspoon Vanilla Extract. Until smooth, creamy and well combined. Allow cinnamon rolls to cool for 15 minutes before frosting. 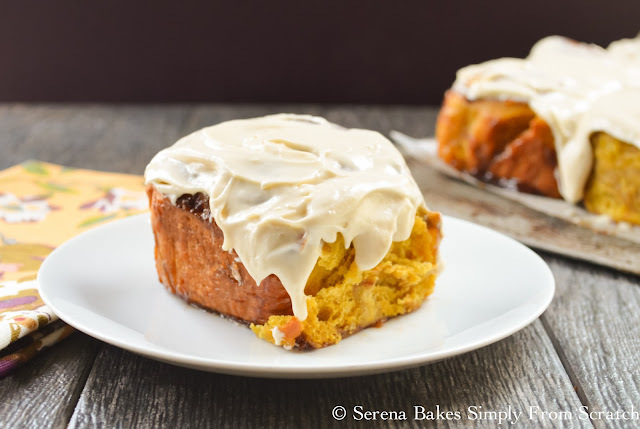 Spread Maple Cream Cheese Frosting over warm rolls and enjoy the goodness! These definitely help warm me up! What foods help warm you up? Please make sure to check out all the other AMAZING Sunday Supper recipes below! 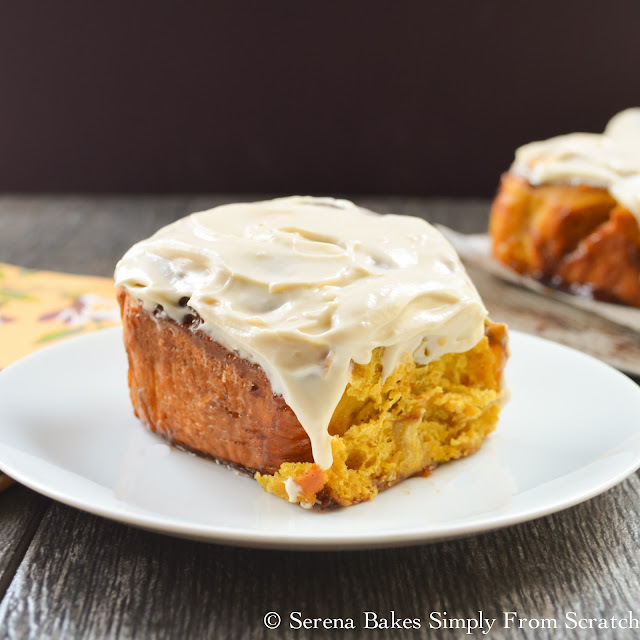 Pumpkin Cinnamon Rolls With Maple Cream Cheese Frosting are perfectly balanced with notes of vanilla, cinnamon, ginger and nutmeg with a sticky gooey cinnamon, brown sugar, honey filling and covered with a sweet maple cream cheese frosting. 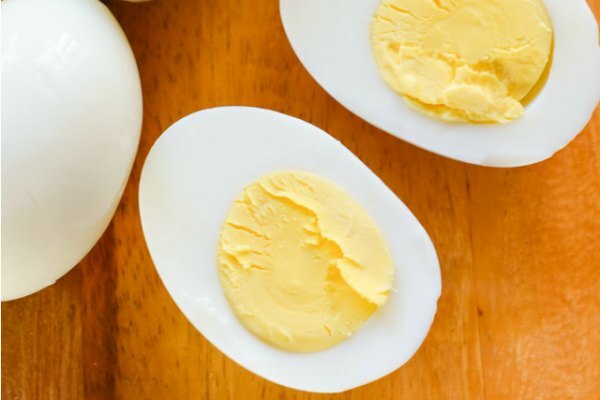 These are so good you won't just eat the center! 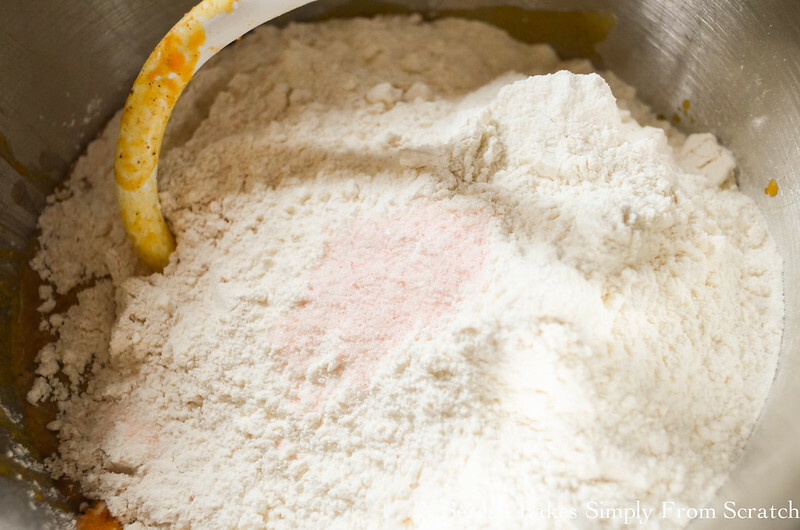 Mix warm buttermilk, honey, and yeast in mixer fitted with a dough hook. 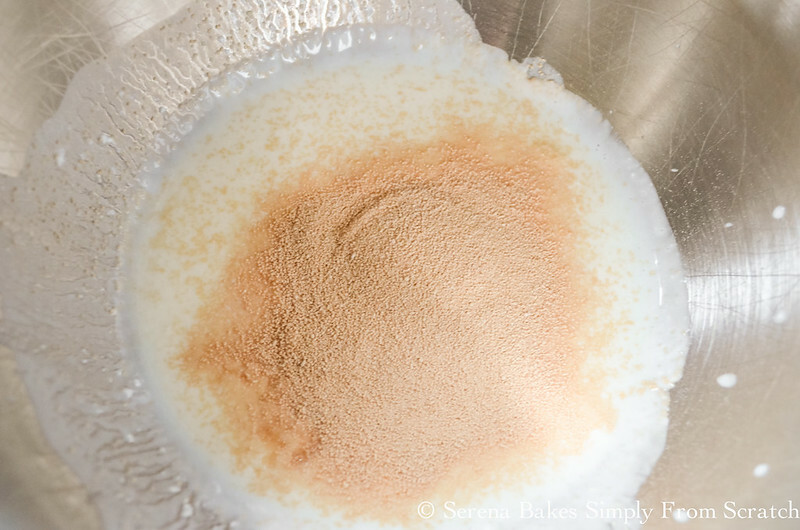 Allow mixture to sit, until bubbly about 8 minutes. 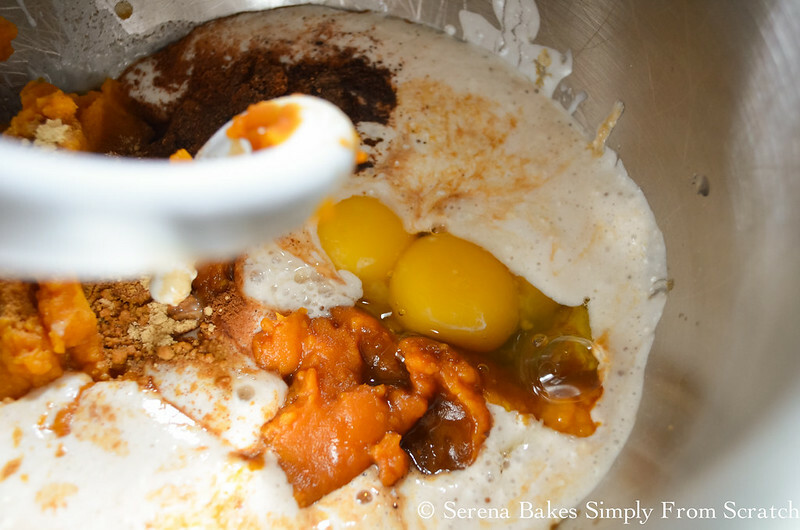 Stir in brown sugar, pumpkin puree, vanilla, cinnamon, ginger, nutmeg, allspice, eggs, and egg yolks, until well combined. Add flour, and salt. Knead on low, and then increase speed to around 4, until soft dough forms that pulls away from bowl and is soft, smooth, and elastic around 5 minutes. Knead in 14 tablespoons butter, 1 tablespoons at a time. Dough will become gooey, and soft. Continue to knead, until dough become soft, smooth, and pulls away from edge of bowl around 8 minutes. 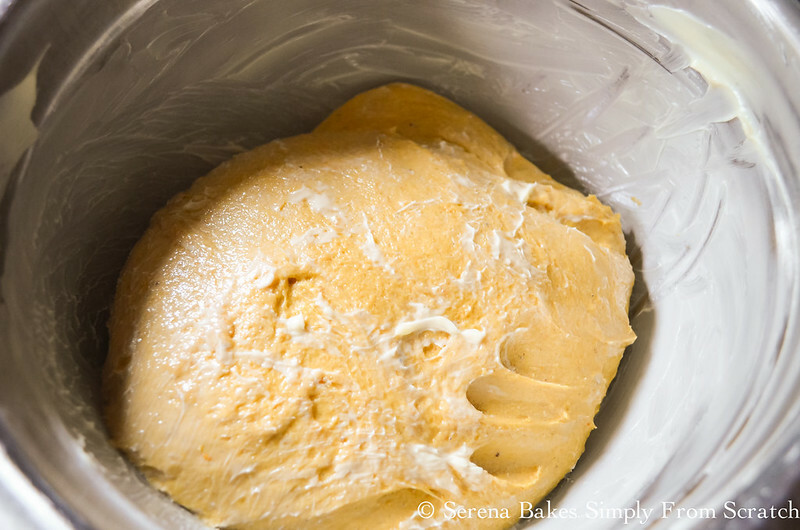 Place dough in a well buttered bowl top first, and then flip over to cover top of dough in butter. Cover bowl, and allow dough to rise, until doubled in size around 2 hours. Mix together 6 tablespoons butter, 1 cup brown sugar, sugar, honey, cinnamon, 1 teaspoon vanilla, and salt, until smooth and well combined. Set aside. Divide dough into two. Roll each half into 12"x18" rectangle. Spread half of the cinnamon filling over each half of dough. 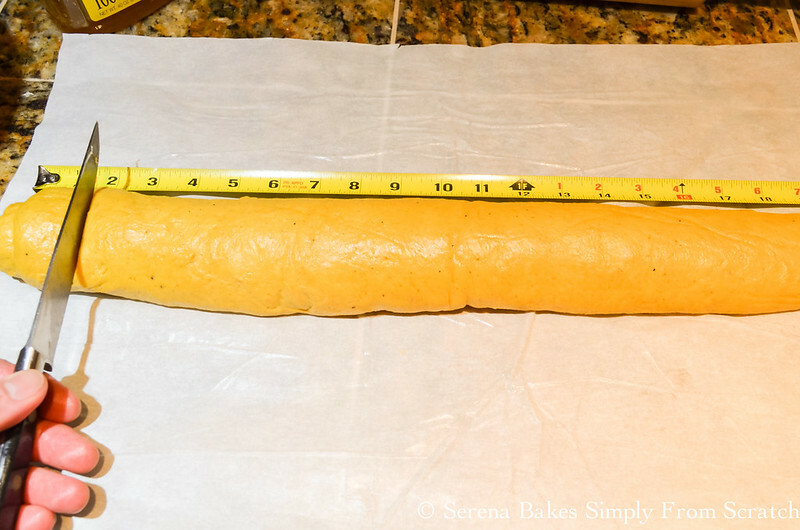 Roll dough to form an 18" long roll, pinch seams tightly, and slice every 2 inches. Butter a 9"x13", and 8"x8". Place rolls evenly spaced into pans, cover, and refrigerate overnight. 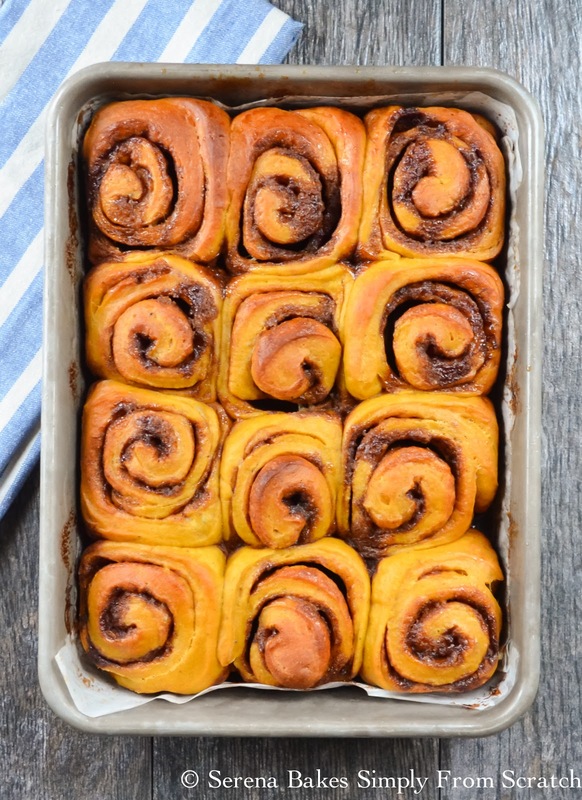 Allow cinnamon rolls to come to room temperature before baking about 30 minutes. Bake Pumpkin Cinnamon Roll for 30-35 minutes until a toothpick inserted into the center comes out clean. Beat together cream cheese, and 1/4 cup butter, until well combined. Add powdered sugar, maple syrup, and vanilla. Beat until well combined. Allow rolls to cool for 15 minutes before frosting with Maple Cream Cheese Frosting. 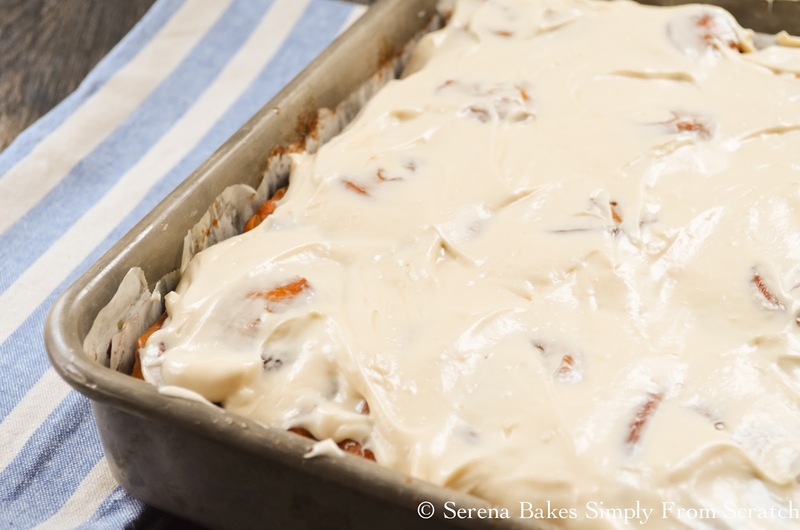 I adore pumpkin desserts, and the idea of something sweet for breakfast - YU!MM!! Your so lucky Shelby! There's nothing like Real Maple Syrup! How cool are those, I love that you have incorporated pumpkin into a classic recipe, makes it perfect for fall! OMG! Please send me a batch of these :) They look so pillowy and comforting. Perhaps the perfect food! Pumpkin combined with cinnamon rolls? Yes please! These look fabulous and I love the flavor twist on a classic! YUM! I love the addition of maple syrup to the frosting. Sounds amazing!!! Oh, my gosh, Serena, these cinnamon rolls look incredible! LOVE the pumpkin twist!! Is is bad that I just want to reach into my computer screen and dip my finger into that frosting? These look delicious! I think that's a good thing Sarah! It means my mission was accomplished! I'm pretty certain I couldn't stop at just one!! I love the flavors in these cinnamon rolls and they look beautiful. Love that color. Oh wow! Love that color! So perfect for autumn. I have had pumpkin cinnamon rolls on my list of things to try for a little while now and t keeps not quite happening. These look and sound so delicious, I must get round to it soon! These are incredible. I love your step by step pics, too! These were great! I made them for work and cut them a little smaller. I ended up getting 32! 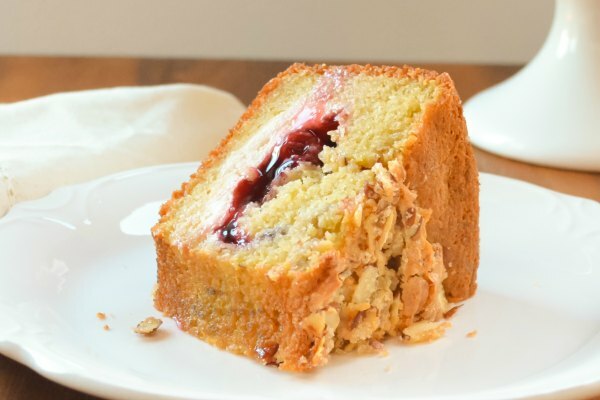 Soooo easy to make and absolutely delicious. Just wondering...should I let them rise again after putting them in the pans, before putting in the fridge? I made them and put them in the fridge right away and when I baked them the next morning they didn’t rise much. I let them sit out for 30 min before putting in the over per instructions but they didn’t rise much when baking.